The Department of Corrections in Wisconsin has a number of correctional facilities at the county, state, and federal level to oversee. 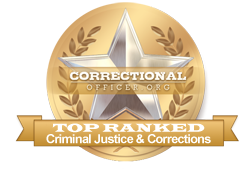 These facilities all require accredited and professional men and women to fill necessary roles as corrections officers. At the county level, jails such as the Winnebago County Jail hold and process pre-sentenced inmates. State prisons like Kettle Moraine Correctional Institution and Milwaukee Secure Detention Facility may range from minimum security to maximum security facilities and take offenders that are serving medium to long-term sentences. Finally, violent offenders fall under federal jurisdiction and are housed at the Federal Correctional Institution, Oxford. However, all these facilities rely on the state and its employees to run effectively. The Bureau of Labor Statistics predicts that growth in the correctional officer industry will continue by 5% over the next 10 years, meaning that by 2022 there will be 10,386 officers in Wisconsin's correctional facilities. For more information about whether this is the right career for you, read on. University of Wisconsin-Parkside ranks first in our latest rankings with 83 students graduating from programs in criminal justice out of a total a thousand graduates in the 2012-2013 school year. University of Wisconsin-Platteville ranks second in our rankings with 162 students completing programs in criminal justice out of a total 3,076 students. "BTC’s criminal justice program works very hard to ensure that our students are well prepared for a variety of careers in the criminal justice field and are capable of providing an immediate positive impact on the communities they serve. The excellent ratings of our program are a direct result of our dedicated faculty and staff and their focus on student success." "Marian University’s Criminal Justice program, in existence for over 18 years, continues to educate students who go on to have distinguished careers in many areas of criminal justice to include corrections. Marian University is proud of their many accomplishments." "Marian University dedicates itself to educating students in a values-based manner. We take great pride in connecting our graduates with jobs in law enforcement and corrections, where they become leaders of their agencies." Waukesha County Technical College ranks 5th in our rankings with 136 students completing programs in criminal justice out of a total three thousand graduates in the 2012-2013 school year. Chippewa Valley Technical College ranks 6th in our latest rankings with 139 students completing programs in criminal justice out of a total 3,806 students in the 2012-2013 school year. Gateway Technical College ranks 7th in our rankings with 151 students graduating from programs in criminal justice out of a total four thousand students. Fox Valley Technical College ranks 8th in our latest rankings with 184 students graduating from programs in criminal justice out of a total 5,446 students in the 2012-2013 school year. Mid-State Technical College ranks ninth in our latest rankings with sixty students graduating from programs in corrections and criminal justice out of a total 1,870 graduates. Nicolet Area Technical College ranks tenth in our latest rankings with forty-two students completing programs in corrections and criminal justice out of a total 1,324 students. Those candidates who prove to be the most qualified after the second hiring phase will be contacted for a personal interview and enrollment in the state's corrections officer training academy. The training phase is designed to prepare officer candidates for working within the corrections environment and to help them achieve improved physical fitness before beginning their new job. Successful completion of this final phase in the hiring process will allow candidates to be placed in vacancies across the state as need dictates. The state Department of Corrections in Wisconsin encourages citizens who are pursuing careers in state service through strong civic growth, namely as correctional officers. At this time, the median income for correctional officers throughout Wisconsin is higher at $42,100 than the national median income at $39,800. According to occupational data for the state of Wisconsin available at http://www.careerinfonet.org/occ_rep.asp?next=occ_rep&Level=&optstatus=011000000&jobfam=33&id=1&nodeid=2&soccode=333012&menuMode=&stfips=55&x=50&y=12 and published by CareerInfoNet.org state trends are predicted to experience a 5% growth curve from now until 2022, putting Wisconsin's rate of growth even with national figures. This predicted growth pattern translates into 230 new openings and existing vacancies annually. The table below lists career information retrieved from the Bureau of Labor Statistics for correctional officers in Wisconsin. The table is sorted by total employment, with the largest metropolitan areas listed first.